Here’s good value. A free one-hour show featuring a selection of comedians, top names among them, currently appearing on the Edinburgh Fringe. Temporarily transported from its spiritual home in the North East, the Hilarity Bites Showcase is a must-see on the Fringe. It’s the place where an ever-evolving cast of performers can advertise their wares and audiences can view the merchandise before buying. Freddie Quinne, last year’s Hilarity Bites New Act of the Year, was an inspired choice as MC. Big, brash and very funny in his own right, he set the tone for the fun ahead. 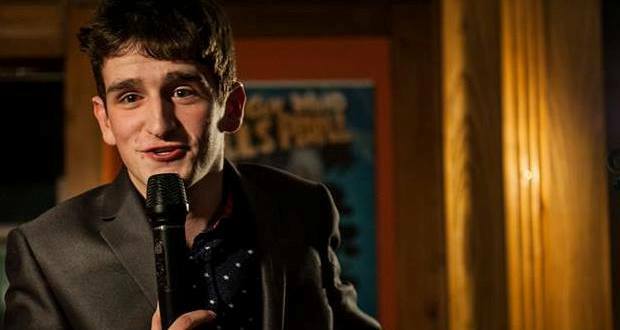 The daunting task of following Freddie on stage as first spot comic fell to Jack Gleadow, the current Hilarity Bites New Act of the Year. Along with a nice line in self-deprecating humour and a liberal sprinkling of puns, Gleadow showed good command of the stage for one of his tender years and experience. His clarity and delivery improved as his confidence grew and he relaxed into his set. Competitions are as much about spotting potential as talent and it’s clear that Jack has both. While he’s still on the foothills as a comedian, there’s no better place to learn than Edinburgh. Back on the Fringe with his second solo hour, Nathaniel Metcalfe is building himself a solid career. He’s a resident at Josie Long’s club in London and garnered useful national exposure on James Acaster’s Findings on BBC Radio 4. There’s a calmness and quietness about Nathaniel on stage that somehow commands the audience to actively listen. That they did, and they laughed at his gentle humour. With the audience expectant and eager for more of the same, it was a surprise that Nathaniel followed up with a knob joke. While initially exciting interest, the routine was extended far beyond funny and all hope of redemption disappeared with its weak conclusion. Despite his choice of material, there remains a down-to-earth likeability about Nathaniel Metcalfe that will continue to win over audiences. Danny O’Brien was next up. Instantly amiable, his easy Irish charm and repartee quickly won over the audience. Rather important, when you’ve only a few minutes to make that vital first impression. A Wicklow boy transplanted to Dublin, he returned to his rural roots for much of his humour. It’s not groundbreaking, but it’s all done with affection and no little style. What Danny also has going for him is he’s young, got a good look and he can tell a story better than most. Hearts and minds won, applause ringing in his ears, Danny was off out the door, rushing to his next gig. He’d done himself no harm. Having come over from Canada in the last two years, headliner John Hastings found much merriment in the contrasts between his home and the UK. Already apparent that we’re in the presence of a sharp comedy mind, John switched into overdrive when a woman left the room during his set. John’s exchange with her partner was hilarious. I’ve never seen a member of the audience cheered for returning to their seat. Anyone nervous of challenging audience participation should probably stay away from John’s show. That said, I’d recommend it to everyone else. Just don’t leave your seat: whatever the consequences, they’ll be less embarrassing than coming to John Hastings’ masterly comic attention.